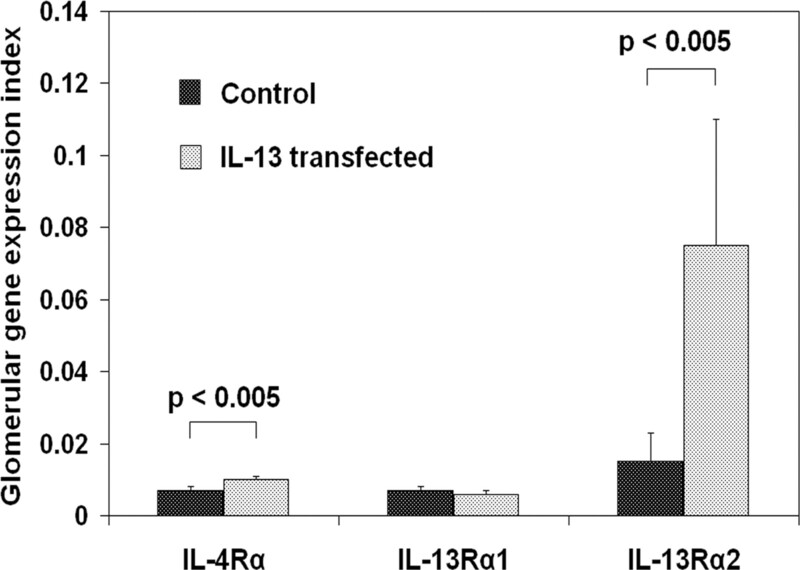 IL-13 has been implicated in the pathogenesis of minimal-change nephrotic syndrome. This study aimed to investigate the role of IL-13 on the development of proteinuria and expression of podocyte-related genes that are associated with nephrotic syndrome. IL-13 was overexpressed in Wistar rats through transfection of a mammalian expression vector cloned with the rat IL-13 gene, into the quadriceps by in vivo electroporation. Serum IL-13, albumin, cholesterol, and creatinine and urine albumin were measured serially. Kidneys were harvested after day 70 for histology and electron microscopy. Glomerular gene expression of nephrin, podocin, dystroglycan, B7-1, and IL-13 receptor subunits were examined using real-time PCR with hybridization probes and expressed as an index against β-actin. Protein expression of these molecules was determined by immunofluorescence staining. The IL-13–transfected rats (n = 41) showed significant albuminuria, hypoalbuminemia, and hypercholesterolemia when compared with control rats (n = 17). No significant histologic changes were seen in glomeruli of IL-13–transfected rats. However, electron microscopy showed up to 80% of podocyte foot process fusion. Glomerular gene expression was significantly upregulated for B7-1, IL-4Rα, and IL-13Rα2 but downregulated for nephrin, podocin, and dystroglycan. Immunofluorescence staining intensity was reduced for nephrin, podocin, and dystroglycan but increased for B7-1 and IL-4Rα in IL-13–transfected rats compared with controls. In conclusion, these results suggest that IL-13 overexpression in the rat could lead to podocyte injury with downregulation of nephrin, podocin, and dystroglycan and a concurrent upregulation of B7-1 in the glomeruli, inducing a minimal change-like nephropathy that is characterized by increased proteinuria, hypoalbuminemia, hypercholesterolemia, and fusion of podocyte foot processes. The pathogenesis of minimal-change nephrotic syndrome (MCNS), the most common cause of nephrotic syndrome in childhood, is unknown. Recent studies indicate that podocyte foot process effacement is the hallmark of nephrotic syndrome (1). The glomerular visceral epithelial cells or podocytes are highly dynamic cells with extensive cytoplasmic processes, which together with the endothelium and glomerular basement membrane (GBM) form the glomerular filtration barrier. The selective barrier for proteins resides in the slit diaphragm (2), which is thought to be a modified adherens junction that is composed of a growing number of proteins, including nephrin, P-cadherin, CD2-associated protech, zona occludens 1, Fat cadherin, podocin, and Neph1 (3). Nephrin is a transmembrane protein of the Ig superfamily located in the slit pore of the podocyte (4). It is localized to signaling domains that are known as lipid rafts (5,6), where, through its association with podocin, it has a critical role insignaling pathways, promoting cell–cell adhesion through homophilic interactions (7). Interference with any of the components of the slit diaphragm may result in functional destabilization of the slit diaphragm and consequent foot process effacement and proteinuria. The podocyte tertiary foot processes are also linked to the GBM by α- and β-dystroglycans, adhesion molecules that are encoded by the gene Dag 1 (8). α- and β-dystroglycans are detected as a transmembrane complex, which is thought to link with the GBM through the binding of α-dystroglycan to agrin and to the actin cytoskeleton through the binding of β-dystroglycan to utrophin (9,10). Because podocyte uses dystroglycan as an adhesion protein to anchor and stabilize itself on the GBM, changes in the expression of dystroglycan in the glomeruli may alter the binding properties of podocyte foot processes to the GBM. There is strong evidence that proteinuria in MCNS is mediated by cytokines (11). We previously demonstrated that IL-13 gene expression was upregulated in both CD4+ and CD8+ T cells in children with steroid-sensitive nephrotic syndrome in relapse (12). This was associated with increased intracytoplasmic IL-13 production by CD3+ cells (13), as well as downregulation of gene expression of the monocyte proinflammatory cytokines IL-8 and IL-12 (14). Our findings were consistent with study of Kimata et al. (15), in which IL-13 was shown to be important for the spontaneous production of IgE and IgG4 by peripheral blood mononuclear cells (PBMC) from nephrotic patients, in contrast to patients with asthma, in whom IL-4 was shown to be the primary cytokine involved. In addition, we were able to demonstrate that genetic polymorphisms in the 3′ untranslated region of the IL-13 gene correlated with long-term outcome of MCNS in Singapore Chinese children, rather than disease susceptibility (16). Moreover, PBMC IL-13 mRNA expression in patients with the haplotype AAT, associated with continuing relapses 5 yr from onset, was significantly higher than those with the haplotype GCC, associated with long-term remission. Unfortunately, the exact role of IL-13 in the pathogenesis of MCNS is not clear. Recently, receptors for IL-13 have been demonstrated in podocytes, with the detection of mRNA expression of IL-4Rα, IL-13Rα1, and IL-13Rα2 in podocyte culture and isolated glomeruli of humans and rats (17). Moreover, stimulation of cultured monolayers of podocytes with IL-13 resulted in a decrease in transepithelial electrical resistance, suggesting possible direct effects of this cytokine on podocytes. In vitro culture of podocytes with IL-13 or IL-4 also resulted in phosphorylation of the signaling molecule STAT6. Because nephrin, podocin, and dystroglycan are important protein molecules in maintaining the integrity of the slit diaphragm and attachment of podocyte foot processes to the GBM, we hypothesized that IL-13 may play an important role in the development of proteinuria in MCNS by exerting a direct effect on podocytes, acting through the IL-13 receptors on the podocyte cell surface, initiating certain signaling pathways that eventually lead to changes in the expression of these podocyte-related proteins. Recently, a novel role was demonstrated for B7-1, a T cell co-stimulatory molecule (18–20) in podocytes, as an inducible modifier of glomerular permselectivity (21,22). Therefore, the aims of this study were first to develop an IL-13 overexpression rat model and subsequently to investigate the role of IL-13 on the development of proteinuria and expression of genes that code for podocyte-related proteins, as well as glomerular B7-1 expression. The complete coding sequence of the rat IL-13 gene was cloned into a mammalian expression vector pCI (Promega, Madison, WI), which contains a cytomegalovirus immediate-early enhancer/promoter region, using the primers as shown: 5′-ctcgagatggcactctgggtgactgc-3′(forward) and 5′-gcggccgctcagtggccatagcggaaaagt-3′(reverse). The cloned pCI mammalian expression vector was transformed into chemically competent TOP10 Escherichia coli (Invitrogen, Carlsbad, CA) by heat shock at 42°C for 30 s. Large-scale production of cloned plasmid was carried out by overnight incubation in Luria-Bertani medium that contained 50 μg/ml ampicillin. Plasmid was subsequently extracted from the bacterial pellet using the NucleoBond endotoxin-free plasmid DNA extraction kit (Macherey-Nagel, Düren, Germany). All animal studies were approved by the Institutional Animal Care and Use Committee of the National University of Singapore. Six-week-old female Wistar rats that weighed approximately 150 to 180 g were used. In vivo electroporation of 200 μg of purified plasmid DNA was carried out every 10 d into the rat quadriceps. The test rats (n = 41) received pCI mammalian expression vector cloned with the rat IL-13 gene, whereas the control rats (n = 17) received the expression vector only. Briefly, a 10-mm 2-Needle Array tip, (BTX; Genetronics, San Diego, CA) connected to a 2-Needle Array electrode, was inserted into the muscle that flanked the area of injection. An electric current, generated by Electro Square Porator ECM830 (BTX; Genetronics), was transmitted through the muscles in six pulses of 20 ms each at 160 V.
For both the IL-13–transfected and control rats, body weight, serum albumin, cholesterol, creatinine, and IL-13 and urine albumin were measured serially. Urine was collected during a 24-h period for all of the rats using metabolic cages every 2 wk. Heparinized blood samples were obtained on days 0, 30, and 60 and at killing. The concentrations of urine albumin and serum/urine IgG were measured in triplicate using a direct sandwich ELISA. The antibodies used were rabbit anti-rat albumin antibody (ICN, Aurora, OH), horseradish peroxidase–conjugated sheep anti-rat albumin mAb (ICN), goat anti-rat IgG (Bethyl Laboratories, Montgomery, TX), and horseradish peroxidase–conjugated goat anti-rat IgG (Bethyl Laboratories). Serum albumin was determined using reagent kits based on the bromocresol purple method, and serum cholesterol was measured by an enzymatic end-point method with quinoneimine being the indicative end product (Randox Laboratories, Crumlin, UK). Plasma creatinine was determined by the alkaline picrate method. Proteinuria selectivity index was calculated according to the following formula: SI = [urine IgG/serum IgG]/[urine albumin/serum albumin]. Serum cytokine levels were determined by ELISA. The following kits were used: Rat IL-13 ELISA kit (BioSource Int., Nivelles, Belgium) and rat IFN-γ kit (eBioscience, San Diego, CA). For IL-2 and IL-4, the following antibodies (R&D Systems, Minneapolis, MN) were used: Goat anti-rat IL-2 antibody, biotinylated goat anti-rat IL-2 antibody, mouse anti-rat IL-4 mAb, and biotinylated goat anti-rat IL-4 antibody. Kidney tissue was harvested and processed for light microscopy, immunofluorescence, and electron microscopy (EM) using standard protocols. Glomeruli were isolated by graded sieving technique from one of the kidneys, and total RNA was extracted by TRIzol reagent (Invitrogen). cDNA was synthesized from 1 μg of total RNA using Moloney murine leukemia virus–reverse transcriptase (Promega). Glomerular gene expression of the IL-13 receptor subunits IL-4Rα, IL-13Rα1, and IL-13Rα2; the podocyte-associated proteins Wilms’ tumor-1 (WT-1), nephrin, podocin, and dystroglycan; and B7-1 were determined by quantitative real-time PCR using LightCycler FastStart DNA MasterPlus HybProbe reaction kit (Roche, Penzberg, Germany). Briefly, the PCR was performed in a final volume of 10 μl of reaction mixture that contained 0.5 μM of each of the primers (Proligo, Singapore), 0.2 μM of each of the hybridization probes (Proligo), 2 μl of master mix, 5 μl of PCR grade water, and 2 μl of cDNA. The nucleotide sequences of primers and probes are summarized in Table 1. The thermal cycling conditions consisted of one cycle of 15 min at 95°C, 45 cycles of 10 s at 95°C, 10 s at 54°C, and 15 s at 72°C, followed by melting curve analysis and cooling to 40°C. Standard curves were created for each PCR run using serial dilutions of plasmid standards that were cloned with the PCR products generated by their respective primers. Results were expressed as an index of the housekeeping gene β-actin. Glomerular protein expression was determined by immunofluorescence technique. Frozen kidney sections were incubated with optimally diluted primary antibodies directed against nephrin (Research Diagnostics, Flanders, NJ), podocin (Alpha Diagnostic Int., San Antonio, TX), α-dystroglycan (Upstate, Lake Placid, NY), B7-1 (eBioscience), WT-1 (Assay Designs, Ann Arbor, MI), synaptopodin (Research Diagnostics), and IL-4Rα (Santa Cruz Biotechnology, Santa Cruz, CA) followed by FITC-conjugated secondary antibodies. Formalin-fixed, paraffin-embedded tissue was used for immunohistochemical detection of IL-4Rα in the glomeruli. After incubation with normal goat serum and suppression of endogenous biotin activity, sections were sequentially incubated with rabbit anti-rat IL-4Rα (Santa Cruz Biotechnology), biotinylated goat anti-rabbit IgG (DakoCytomation, Glostrup, Denmark), and StreptABComplex/AP (DakoCytomation). 5-Bromo-4-chloro-3-indoyl-phosphate/nitroblue tetrazolium (DakoCytomation) was used as substrate for alkaline phosphatase activity. The IL-13–transfected rats showed elevated serum IL-13 levels (mean ± SEM) of 513.0 ± 103.2, 268.0 ± 76.5, and 321.1 ± 76.0 pg/ml compared with almost undetectable levels of 5.6 ± 1.3, 5.6 ± 1.3, and 7.3 ± 1.9 pg/ml in the control rats at days 30, 60, and 70, respectively (P < 0.001; Figure 1). No significant difference was detected in the serum levels of IL-2 (54.2 ± 12.3 versus 110.1 ± 24.1 pg/ml) and IL-4 (33.3 ± 6.1 versus 20.3 ± 3.2 pg/ml) between the control and IL-13–transfected rats, respectively. IFN-γ was undetectable in sera of both the control and IL-13–transfected rats. Serum levels of IL-13 in the control rats (n = 17) and the IL-13–transfected rats (n = 41) at days 30, 60, and 70. Data are means ± SEM. There was a significant increase in body weight of the IL-13–transfected rats during the course of the experiment (Figure 2), where the mean body weight (±SEM) at death was 314 ± 6 g compared with 288 ± 8 g for controls (P = 0.02). Urinary albumin excretion in the IL-13–transfected rats increased progressively from day 14 onward, reaching a peak of 3.45 ± 0.89 mg/24 h at day 70 before killing compared with 0.36 ± 0.04 mg/24 h in controls (P < 0.001; Figure 3). For rats with heavy proteinuria defined as ≥4 mg/24 h, the proteinuria selectivity index was 0.26 ± 0.05 (median 0.19). As shown in Table 2, of the 41 IL-13–transfected rats with proteinuria, 34 had serum albumin levels >30 g/L (mean 40.7 ± 1.3 g/L) (group 1), whereas seven had nephrotic syndrome with serum albumin ≤30 g/L (mean 25.5 ± 2.2 g/L; group 2). Gross ascites was noted in three of the seven rats in group 2. In addition, the IL-13–transfected rats had significantly higher mean serum cholesterol levels (3.39 ± 0.34 mmol/L) than control rats (1.72 ± 0.05 mmol/L; P < 0.001). 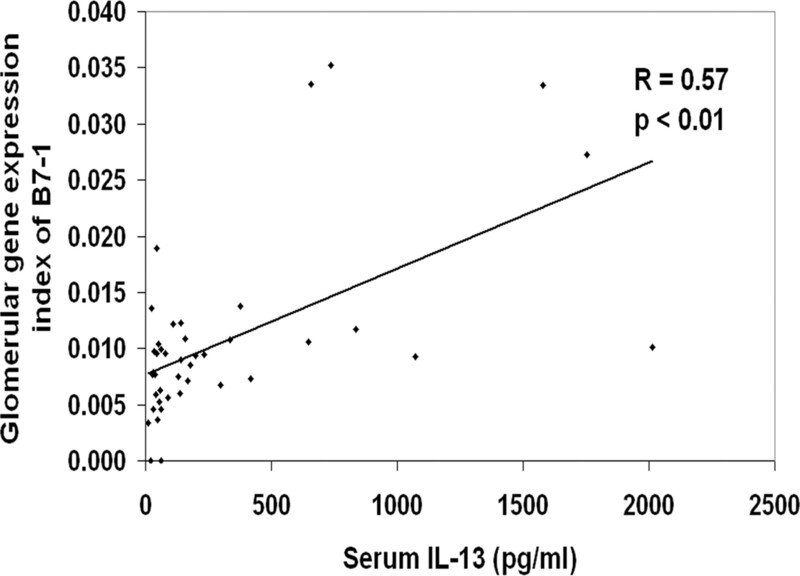 It is interesting that in the IL-13–transfected rats, serum IL-13 correlated significantly only with serum cholesterol levels (r = 0.51, P = 0.001) but not with serum or urine albumin levels. No significant difference was detected in the serum levels of creatinine and IgE. 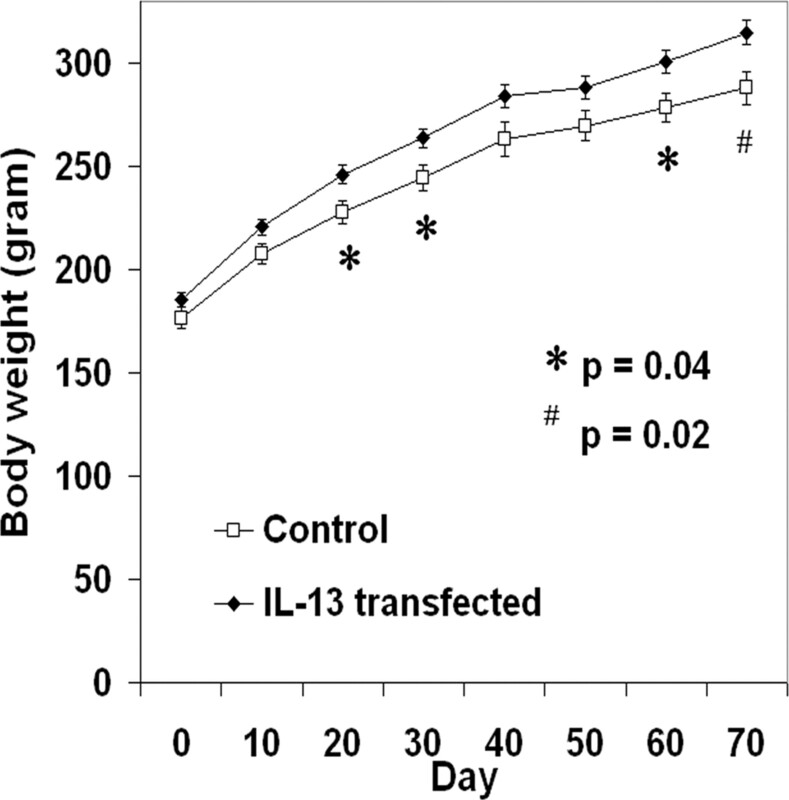 Mean body weight of control rats (n = 17) and IL-13–transfected rats (n = 41) measured at 10-d intervals. Data are means ± SEM. Mean 24-h urine albumin excretion (mg/24 h) of control rats (n = 17) and IL-13–transfected rats (n = 41) measured at 14-d intervals. Data are means ± SEM. 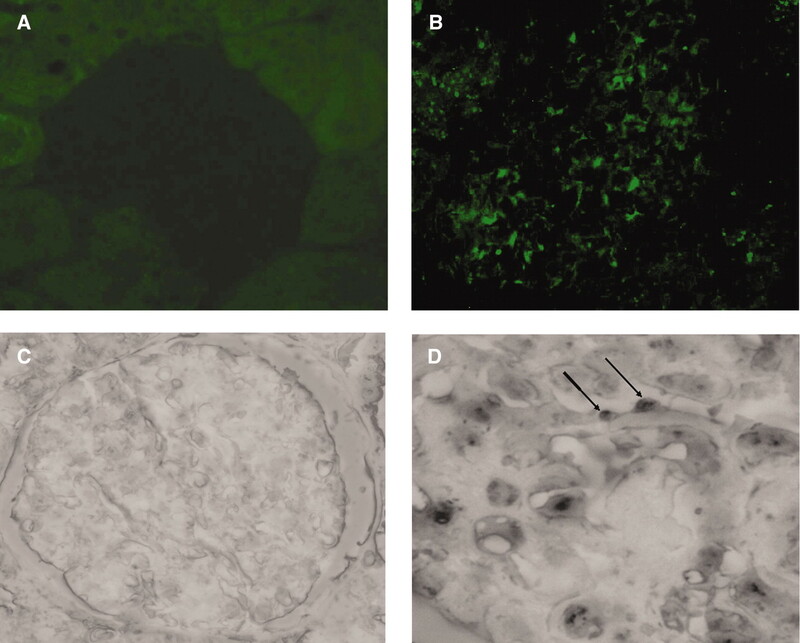 Histologic examination of the kidneys in IL-13–transfected rats showed no significant glomerular changes on light microscopy (Figure 4A), similar to controls. In particular, there was no evidence of mesangial proliferation or sclerosis. Immunofluorescence study revealed small amounts of IgM in the mesangium of the glomeruli only from IL-13–transfected rats in group 2. However, EM showed up to 80% of podocyte foot process fusion in rats that overexpressed IL-13, especially in group 2 nephrotic rats (Figure 4B), whereas no podocyte foot process effacement was seen in the controls (Figure 4C). Histopathologic features on day 70 at killing. (A) Glomerulus of IL-13–transfected rat showing no significant histologic changes (periodic acid-Schiff stain). (B) Glomerulus of IL-13–transfected rat showing fusion of podocyte foot processes (arrows). (C) Glomerulus of control rat showing normal individual podocyte foot processes along the glomerular basement membrane (GBM; arrows). Magnifications: ×400 in A; ×7100 in B; ×11,000 in C.
Glomerular gene expression of the IL-13 receptor subunits IL-4Rα (0.010 ± 0.0007 versus 0.007 ± 0.0009; P < 0.005) and IL-13Rα2 (0.076 ± 0.036 versus 0.015 ± 0.008; P < 0.005) were significantly increased in the IL-13–transfected group compared with controls (Figure 5). However, there was no difference in glomerular gene expression of the IL-13Rα1 subunit between the two groups (0.0055 ± 0.0005 versus 0.0073 ± 0.0009). Conversely, the glomerular gene expression of the podocyte-associated proteins podocin, nephrin, and dystroglycan was significantly decreased in the IL-13–transfected rats that were nephrotic (group 2) as compared with proteinuric rats (group 1) and controls. No significant change was detected in the glomerular gene expression of WT-1 between the control rats and the IL-13–transfected rats (Table 2, Figure 6). It is interesting that there was a concurrent upregulation of glomerular gene expression for B7-1 in the IL-13–transfected rats, especially the nephrotic rats in group 2, compared with the control group (Table 2, Figure 7, A and B). The glomerular B7-1 expression also correlated significantly with serum IL-13 levels in the IL-13–transfected rats (r = 0.57, P < 0.01; Figure 8). Glomerular gene expression of the IL-13 receptor subunits IL-4Rα, IL-13Rα1, and IL-13Rα2 in control rats (n = 17) and IL-13–transfected rats (n = 41), standardized against β-actin. Data are means ± SEM. Glomerular gene expression of Wilms’ tumor-1 (WT-1), nephrin, podocin, and dystroglycan in control rats (n = 17), proteinuric IL-13–transfected rats (group 1, n = 34), and nephrotic IL-13–transfected rats (group 2, n = 7), standardized against β-actin. Data are means ± SEM. B7-1 expression in IL-13–transfected rats and controls. (A) Glomerular gene expression of B7-1 in the control rats (n = 17), proteinuric IL-13–transfected rats (group 1, n = 34), and nephrotic IL-13–transfected rats (group 2, n = 7). Data are means ± SEM. (B) Glomerular gene expression of B7-1 as shown on agarose gel electrophoresis. Lanes 1 through 6, control rats; lanes 7 through 12, IL-13–transfected rats, where lane 8 represents a nephrotic rat in group 2. (C) Glomerulus of control rat showing no fluorescence signal for B7-1. Primary antibody is mouse anti-rat CD80 (B7-1), diluted 1:10 (eBioscience). Secondary antibody is goat anti-mouse IgG1, FITC conjugated, diluted 1:200 (Santa Cruz Biotechnology). (D) Glomerulus of nephrotic IL-13–transfected rat in group 2 showing strong staining for B7-1 in a patchy pattern. Magnification, ×400. Correlation between serum IL-13 and glomerular gene expression of B7-1 in IL-13–transfected rats (n = 41). Immunofluorescence examination showed that nephrin, podocin, and dystroglycan all stained strongly as a continuous granular pattern along the GBM in the control rats. This was in contrast to the nephrotic rats, in which the fluorescence signal was much weaker and in a discontinuous, and sometimes segmental, granular pattern along the GBM (Figure 9). Conversely, staining for both WT-1 and synaptopodin was similar in control and nephrotic rats. Immunofluorescence staining of glomeruli for protein expression of nephrin, podocin, dystroglycan, and synaptopodin. Glomerulus of control rat showed strong continuous and granular staining pattern of nephrin (A), podocin (C), and dystroglycan (E) along the GBM. Glomerulus of nephrotic rat showed a much weaker, discontinuous, sometimes segmental, granular staining pattern of nephrin (B), podocin (D), and dystroglycan (F). There was no significant difference between the control (G) and nephrotic (H) rats in the expression of synaptopodin, which showed strong and continuous staining along the GBM. Magnification, ×400. Whereas no fluorescence signal was seen in the glomeruli of control rats for IL-4Rα, some small, scattered fluorescence signal of moderate intensity for IL-4Rα was seen in most of the glomeruli of nephrotic rats (Figure 10, A and B). Immunohistochemical staining showed that expression of IL-4Rα was localized to podocytes (Figure 10, C and D). 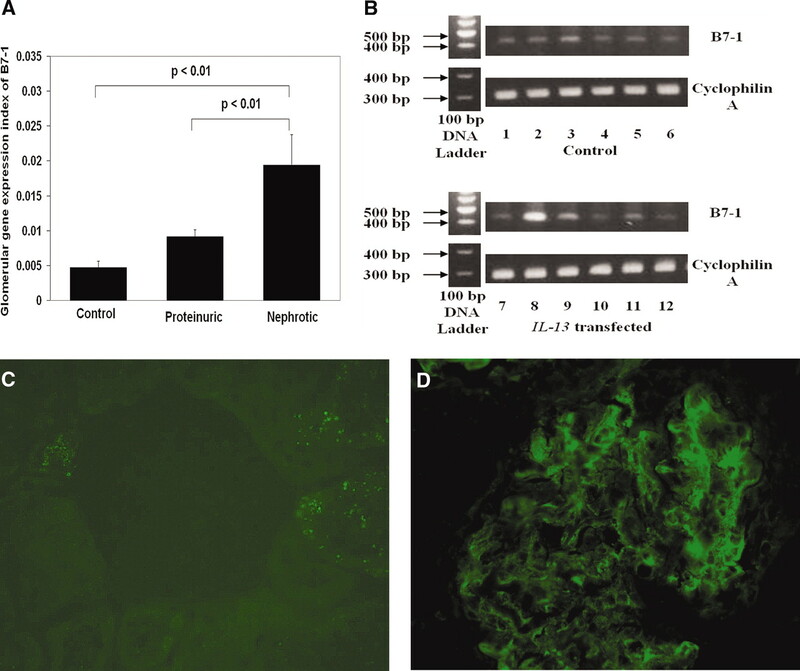 The glomeruli of nephrotic rats showed strong staining for B7-1 in a patchy pattern (Figure 7, C and D), whereas no fluorescence signal was detected in the control rats. Glomerular protein expression of IL-4Rα. Immunofluorescence staining of glomeruli for IL-4Rα expression. Whereas no fluorescence signal for IL-4Rα was detected in glomerulus of control rat (A), small scattered fluorescence signal of moderate intensity for IL-4Rα was detected in glomerulus of nephrotic rat (B). Immunohistochemical staining of glomeruli for IL-4Rα expression. Whereas no staining was detected in the glomeruli of control rats (C), some podocytes in the glomeruli of IL-13–transfected rats showed positive staining for IL-4Rα (arrows) (D). Magnification, ×400. Current evidence suggests that MCNS may be a primary T cell disorder that results in glomerular podocyte dysfunction. Immunologic triggering factors, such as viral infections or allergy, are associated with alterations in the permselectivity barrier of the glomerular capillary wall, resulting in proteinuria and the nephrotic syndrome. In a review, Mathieson (23) alluded to a Th2 cytokine bias in patients with MCNS. This was further supported by the findings that were obtained by screening a cDNA library from T cell–enriched PBMC of patients with nephrotic relapse, in whom overexpression of truncated c-maf–inducing protein induced c-maf, transactivated the IL-4 gene, and downregulated IFN-γ expression, characteristic of Th2 commitment (24). Our earlier work showed a possible correlation between upregulation of T cell IL-13 in children with MCNS in relapse (12). Moreover, there is a widely recognized association between MCNS and Hodgkin's disease, and IL-13 is known to be an autocrine growth factor for the Reed-Sternberg cell in Hodgkin's lymphoma (25), being highly expressed in both the Reed-Sternberg cells in biopsy samples and tumor cell lines (26,27). This study attempted to define the pathogenic relationship between IL-13 and podocyte foot process effacement, with development of nephrotic-range proteinuria. In vivo electroporation is a safe and simple approach for in vivo expression of biologically active proteins (28,29). Expression of the IL-13 gene using the pCI mammalian expression vector would allow complete posttranslational modifications within the mammalian system and, hence, the biologic activities. Unlike the control rats, our data showed that the IL-13–transfected rats were continuously under the influence of elevated levels of serum IL-13 without any concomitant changes in other Th1 (IL-2 or IFN-γ) or Th2 (IL-4) cytokines. Hence, in this model, IL-13 acts as a circulating factor mimicking a Th2 cytokine bias as observed in patients with MCNS. The IL-13–transfected rats showed significant albuminuria worsening over time, with development of frank nephrotic syndrome as defined by generalized swelling and significant increase in body weight, low serum albumin ≤30 g/L, and hypercholesterolemia. The heavy proteinuria that was seen in these rats was selective in nature, consistent with a minimal-change nephropathy. It is interesting that in the IL-13–transfected rats, there was a direct correlation between serum IL-13 and serum cholesterol levels; however, no relationship between serum IL-13 and urinary albumin excretion or serum albumin levels was seen. This observation is consistent with the hypothesis that a serum factor may be responsible for the marked hypercholesterolemia that is seen in patients with idiopathic nephrotic syndrome and not related solely to the degree of albuminuria as shown in other experimental rat models of nephrotic syndrome, namely puromycin nephropathy and spontaneous FSGS (30–32). The IL-13–transfected rats developed a minimal-change–like glomerulopathy, as evidenced by the absence of significant glomerular light microscopic changes. However EM revealed up to 80% fusion of podocyte foot processes, especially in the IL-13–transfected rats, which developed the nephrotic syndrome. 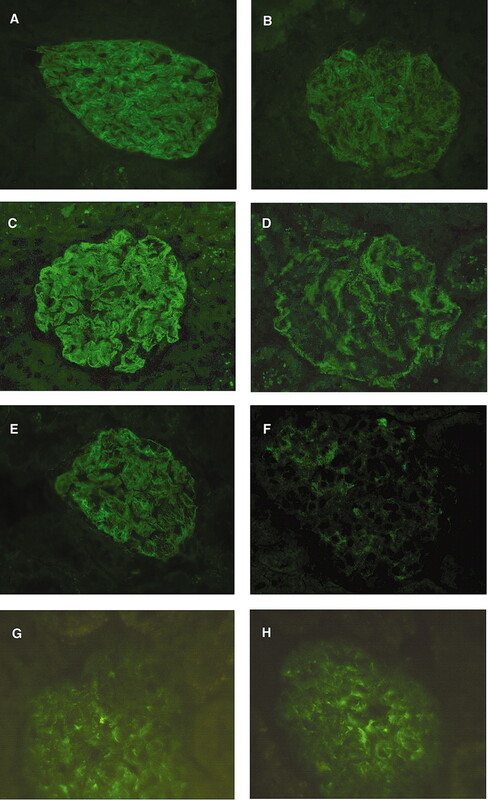 Immunofluorescence study revealed a small amount of IgM in the mesangial area of the glomerulus from IL-13–transfected rats with nephrotic syndrome, reminiscent of the spectrum of MCNS with IgM deposits in humans. Maintenance of the tertiary podocyte foot process structure is critical for the proper functioning of the glomerular filtration barrier. This is best illustrated in MCNS, where the only pathologic change demonstrable is the extensive fusion of podocyte foot processes. The decrease in the expression of nephrin, podocin, and dystroglycan at both the transcriptional and the translational levels in our IL-13–transfected rat model was found to be associated with increased urinary albumin excretion and podocyte foot process effacement, suggesting that these proteins are essential in maintaining the filtration barrier, thus controlling glomerular permeability. This decrease was not due to loss of podocytes, because the glomerular expression of WT-1 and synaptopodin, which are specific cell surface markers of podocytes, showed no significant difference between the control rats and the IL-13–transfected rats. Downregulation of the glomerular gene and protein expression of nephrin, podocin, and dystroglycan in this IL-13–transfected rat model of minimal-change nephropathy parallels the findings in other experimental models as well as human nephrotic syndrome. Gene and protein expressions of nephrin are known to be decreased both in animal models such as puromycin nephropathy or mAb 5-1-6 nephropathy (33,34) and in kidney biopsies of patients with glomerular diseases, including membranous glomerulonephritis, MCNS, and FSGS (35,36). An 80% decrease in mRNA expression of nephrin was detected at the peak of proteinuria in puromycin nephropathy, and this preceded the onset of proteinuria (33). In many of these studies, immunofluorescence showed extensive loss of staining for nephrin in the glomeruli, with a shift from a linear to a granular pattern (33–35). This was always accompanied by redistribution of nephrin protein from the filtration slit to the podocyte plasma membrane as shown by immunoelectron microscopy (33,36,37). Downregulation of podocin expression has been reported in puromycin nephropathy (38), as well as in children with primary nephrotic syndrome who were in relapse at the time of kidney biopsy (39). This was characterized by a change from a linear to a discontinuous and granular pattern of staining on immunofluorescence, similar to our IL-13–transfection model. It is interesting that in the puromycin nephropathy model, onset of proteinuria and effacement of podocyte foot processes were found to parallel decreased protein expression rather than changes in mRNA expression of podocin (40,41). Similarly, protein expression of dystroglycan is known to be reduced in both experimental models of nephropathy and human kidney biopsies. Decreased protein expression of dystroglycan has been found in Adriamycin nephropathy (9), puromycin nephropathy, and protamine sulfate perfusion (42), and this was accompanied by podocyte foot process flattening and heavy proteinuria. In Adriamycin nephropathy, immunofluorescence staining revealed a reduced staining intensity for dystroglycan along the glomerular capillary wall, whereas immunoelectron microscopy showed a redistribution of dystroglycan in proteinuric rats as compared with controls. Quantitative immunoelectron microscopic examination of human renal biopsies has demonstrated a reduction in the density of α- and β-dystroglycan on the podocytes’ soles in MCNS, which returned to normal after steroid treatment (43). Recent studies have shown a possible association between induced expression of B7-1 on podocytes and development of proteinuria (21). B7-1, also known as CD80, is a cell surface glycoprotein that normally is expressed on the surface of B cells and other antigen-presenting cells. It acts as a co-stimulatory molecule when bound to CD28 expressed on T cells and helps to modulate T cell receptor signals (44). Wild-type mice that were administered an injection of low-dosage LPS developed transient nephrotic-range proteinuria, associated with effacement of podocyte foot processes without evidence of glomerular inflammation, similar to that seen in human MCNS. Induction of podocyte B7-1 expression was shown to be essential for the development of proteinuria in these mice. Our IL-13 transfection model is the first study to demonstrate a significant correlation between serum IL-13 levels and B7-1 expression in the glomeruli of nephrotic rats with a minimal-change–like nephropathy. Previous studies have shown that IL-13 in combination with IL-1α and IFN-γ could induce B7-1 expression on human proximal tubular epithelial cells (45). In this experiment, we demonstrated increased glomerular IL-4Rα and IL-13Rα2 gene expression, as well as increased protein expression of IL-4Rα, localized to the podocytes in most of the glomeruli of nephrotic rats, suggesting that IL-13 may act directly on podocytes. Therefore, our results further strengthen the hypothesis that transient upregulation of B7-1 could occur in MCNS, resulting in nephrotic-range proteinuria, and also provide an explanation for the possible link among Th2 cytokine bias, atopy, and MCNS. This work was supported by grants from the National Medical Research Council (NMRC: 0830/2004), Biomedical Research Council (A*STAR: 04/1/21/19/341), and University Academic Research Fund (R-178-000-081-112). This article was presented at the 37th annual meeting of the American Society of Nephrology; October 29 through November 1, 2004; St. Louis, MO. We thank Dr. L.N. Liew for technical advice.